The world is still warming, sea levels are still rising, and the Antarctic Peninsula is home to Earth's newest nation, with life quickened by ecopoets spreading across valleys and fjords exposed by the retreat of the ice. Austral Morales Ferrado, a child of the last generation of ecopoets, is a husky: an edited person adapted to the unforgiving climate of the far south, feared and despised by most of its population. She's been a convict, a corrections officer in a labour camp, and consort to a criminal, and now, out of desperation, she has committed the kidnapping of the century. But before she can collect the ransom and make a new life elsewhere, she must find a place of safety amongst the peninsula's forests and icy plateaus, and evade a criminal gang that has its own plans for the teenage girl she's taken hostage. 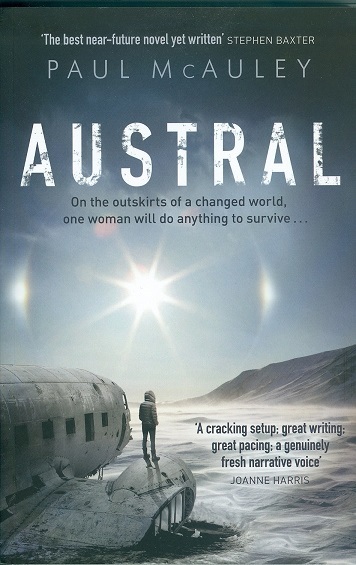 Blending the story of Austral's flight with the fractured history of her family and its role in the colonisation of Antarctica, Austral is a vivid portrayal of a treacherous new world created by climate change, and shaped by the betrayals and mistakes of the past.